Let's see this week I've been finishing up quilt blocks...I finished my April's BOM, and almost done with my bee blocks, 3 down 2 to go. And I finished the last block in a quilt for my dad...my sisters (Heather and Amy) and my mom and I all made three blocks for my dad. Two of the three had to be union jack style and the third could be whatever. We kept the colors pretty much the same, reds, royal-navy blue and white. 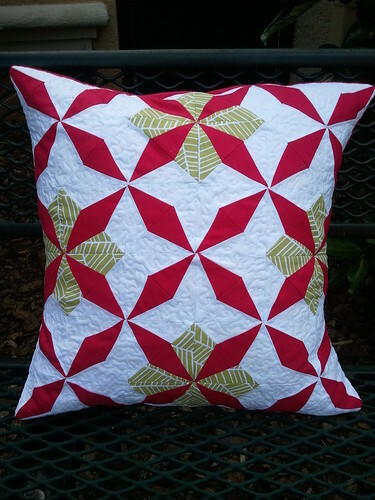 It should be a really cool (and maybe a little funky) quilt. We're giving it to him for his birthday or Father's day, both in June! We will most definitely be sharing this one with you!! I am so excited to see it put together. I have to tell you looking through Fabric Tuesday links is one of my favorite things to do in the week! I get a little snack and get all comfy and start clicking away. Sorry we aren't so good at commenting sometimes (naughty naughty) it's just a matter of time some weeks. Anyway I love it, and so here are some of the ones that made me giddy this week! I love that tote bag - the typewriter print is so cool! The quilted kitchen floor mat is SO CUTE! 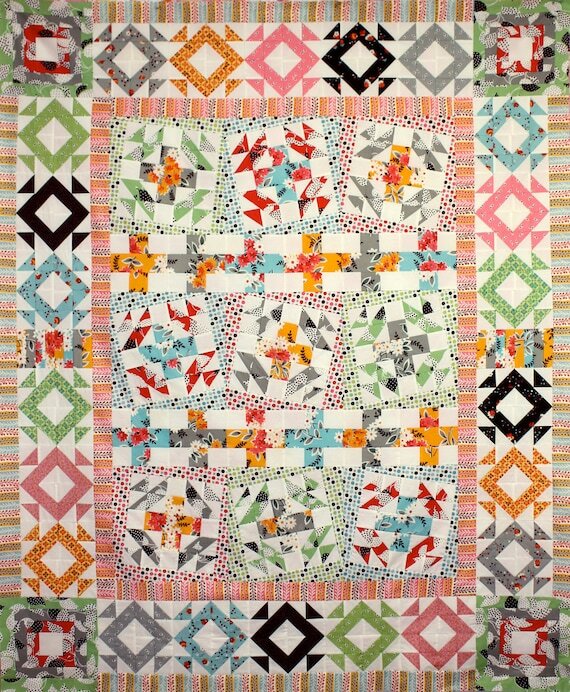 Nice projects you highlighted - love that Heather has been so scrappy lately and fancy wonky is really a fun quilt - loved reading about how it came together! Oops. I messed up my link! I meant to add the pic. of my tote but clicked the wrong button and couldn't fix it. Anyway! Love the projects you've shown!